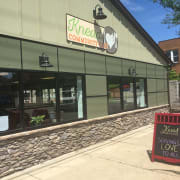 Knead Community Café is a unique gathering place that nourishes both body and soul. Offering meals that are pay-what-you-can/pay-it-forward, we provide fresh, wholesome food that is seasoned with love, where all are welcome. Our hope that the café will be a place where strangers become friends and also promote a sense of goodwill among neighbors. That good things may happen when centered around the table. We are a non-profit community run and supported restaurant where people can break bread over a delicious meal. We encourage a partnership with all community members offering those individuals in need of a hand up the opportunity to volunteer in exchange for a great dining experience. By taking care of each other, we believe we are making an investment in our neighborhoods and this world. With only two paid positions at the cafe, we rely on the generosity of volunteers who want to serve in all capacities at the cafe in addition to offering their talents and treasures in all things non profit including fundraising, event planning, grant writing or other addmistrative tasks. Would you recommend KNEAD COMMUNITY CAFE?